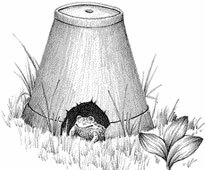 A quick and easy outdoor project, adding a toad home to your backyard is a great way to provide a cool spot for these shade-loving creatures. Not only will the toad thank you for the chill out spot, your garden will thank you too — 90 percent of a toad’s diet consists of garden pests! Use an old clay pot about 20 centimetres in diameter. Place the pot upside down in a shady spot near a source of water. Visit www.WildAboutGardening.org for more ideas for amphibian accommodations.